I’m what you might call a colossal time waster, and/or very easily distracted. I noticed earlier today that Saved by the Bell, a show that I love, and have been threatening to re-watch for years, is on Netflix Instant. I flipped through the episode list, and noticed that some the ordering didn’t make any sense. Particularly outstanding were the fact that there were only 4 seasons of the show, yet 6 are available on Netflix, and that the graduation happens at the end of the next to last season, when I specifically remember that being the end of the series. So, I decided to put my research cap on. The order presented on Netflix Instant is, in fact, the order that the episodes were released on the DVDs. However, the actual airdate order is vastly different. If, like me, you would rather watch the show as it originally aired, I’ve made up a handy-dandy guide. Please Note: Season One on Netflix is actually the first and only season of another show called, “Good Morning, Miss Bliss”. While some of the characters carry over, it’s not really essential viewing. The Saved by the Bell: Hawaiian Style movie actually fits in-between Seasons 3 and 4. It’s been released on DVD, but it’s not available from Netflix through either their instant, or disc by mail services. There it is, folks. You’re welcome. You may not know this about me, but I’m slightly obsessed with reality TV. I love shows like American Pickers, Mythbusters, Swamp People, The Colony, and Storage Wars. I don’t gravitate toward the competition based ones, but I’ll give just about any show that revolves around an interesting job a watch (I even watched Parking Wars once, it was awful). Another thing you may not know is that I own my own comic shop (Hurley’s Heroes, Joplin, Missouri). Given these facts, you’d think that AMC’s new show “Comic Book Men” would be right up my alley. However, this show does nothing but disappoint. The episode actually starts off on a good foot, with a neat “podcast” framing sequence. The podcast allows for reflection on the situations as they play out without using the “confessional” shots that litter most reality shows. It’s a pretty great work around, and it’s easily my favorite part of the show. That’s more influenced by my fascination with reality TV structure than by my love of the subject matter though. The subject matter is handled… like a bad reality show. Everything in this show feels forced and fake. I’m not an idiot, I realize that reality TV is written, and that the majority of “random encounters” are completely manufactured, but this show is seriously hackey. It follows almost the exact same structure as another overly forced show, Pawn Stars. Featuring: The Boss, The Second in Command, The Grizzly Dude WIth No Apparent Purpose, and The Guy Everybody Shits On. Rather than focusing on how a small business is run, what kind of astounding effort goes into maintaining a stock that rotates on a weekly basis, or the colorful cast of customers that no doubt frequent the store, we get another show about buying collectibles. People bring interesting items into the store, and guys give a little history of the item, make some sexual references, and then try to come up with a price. If you’ve never seen Pawn Stars before, it’s EXACTLY THE SAME. For one item, Walt even calls in a buddy of his for help with an appraisal (which is a fairly legit thing, it’s just usually done over the phone). 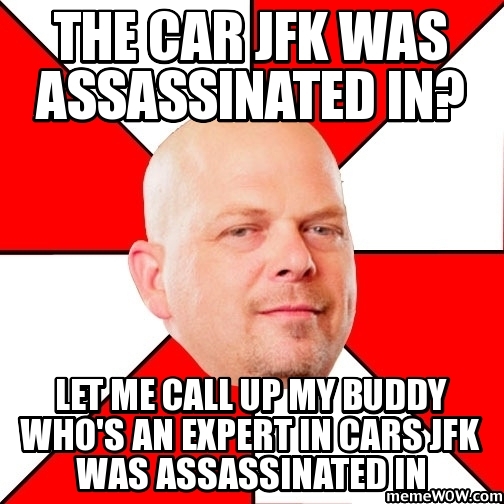 This is THE classic Rick move on Pawn Stars. They did run into some neat stuff, the Bob Kane original was particularly cool, but that doesn’t make a good or original show. I still think that a great show could be made based around the everyday workings of a comic shop, but the focus needs to be on the uniqueness of the comic market, not the way that it’s just like a pawn shop.